Preterm birth (PTB) is defined as birth of baby before 37 completed weeks of gestation. It affects approximately 12.5% of births in the United States and it is implicated in approximately two-third of neonatal mortality.,, Although there have been significant improvements in neonatal intensive care unit (NICU) care with the availability of surfactant, antibiotics, and improved maternal care with steroids and tocolytics, still the PTB remains high contributing to significant neonatal morbidity and mortality. This neonatal mortality can be brought down by preventing PTB, which will require addressing the causes of PTB. Etiological factors for PTB could be many – hemorrhage during pregnancy, short cervix, uterine anomalies, extremes of age, multiple pregnancy, smoking, and low socioeconomic status, etc., to name a few. Treatment aimed at reducing PTB have used tocolytics, steroids, reduction in physical activity, lifestyle changes, omega-3 fatty acids, but these have not shown much promise in various trials. Progesterones and cervical cerclage have shown some promise and is being investigated further. The molecule, dose, route, and duration of administration are still being evaluated. A history of prior PTB is one of the most important predictors for PTB due to high chances of recurrence. Many studies were conducted to know the effect of progesterone,, on PTB, on oral or vaginal micronized progesterone as well as on 17-OH progesterone caproate injections with conflicting results over the last few years. Cochrane's review in 2013 stated that although administration of progesterone for women with a previous history of PTB or with short cervix may reduce their risk of PTB, the optimal dose and route and progesterone are still unknown which can have an impact on perinatal outcomes. Thus, they suggested performing further randomized-controlled trials in this field. Most studies have focused on prevention of preterm labor; very few studies have addressed the effect of long-term progesterone use on neonates. This study was planned to know the effect of vaginal progesterone on women with a history of PTB on pregnancy and neonatal outcome. The present prospective study was conducted in the Department of Obstetrics and Gynecology at Sri Aurobindo Medical College and Postgraduate Institute, Indore (MP), for 2 years till July 2014. Pregnant women were recruited from the antenatal outpatient department. Detailed obstetrical history including number of previous preterm deliveries, induced or spontaneous preterm deliveries, and number of abortions were taken. Patients with a history of at least previous one spontaneous preterm vaginal delivery were recruited. Medical history, history of any infection, and history of any surgical procedure done before were also taken, and risk factors for preterm labor pain were evaluated and recorded. Gestational age was confirmed by Ultrasonography (USG) or clinically. Complete general physical examination was done which included measurement of height, weight, and vitals. General examinations for pallor, icterus, and edema were done. The respiratory, cardiovascular, and per abdomen examinations were done in all cases. A gentle per speculum examination was done to look for any discharge or infection. Routine antenatal investigations were done. A detailed ultrasound was done to rule out any congenital malformations and to evaluate the length of the cervix. The gestational age was confirmed by USG where clinical dating was not reliable. Other investigations, as routinely done for women having bad obstetric history, were carried out as required. The patients received vaginal micronized progesterone 100 mg twice daily starting at 14–28 weeks [recruitment period] and continued till 34 weeks of pregnancy. Patients were trained to insert the pessary at the first visit and advised all the necessary steps to maintain the hygiene. Any other complaints such as giddiness, nausea, vomiting, and discharge per vaginum. A patient's compliance was ensured. Therapy was continued till 34 weeks. The patient's cervical length monitoring was done every 2–4 weeks by USG. The patients who went into preterm labor were managed according to the standard hospital protocol. All patients received two doses of 12 mg betamethasone intramuscularly within an interval of 24 h if they developed preterm labor before the 34 weeks of gestation. The study was approved from the Ethical and Research Committee of Sri Aurobindo Medical College, and Postgraduate Institute, Indore (MP). A total of 64 women were included in the study, out of which three were lost to follow-up and one had major congenital malformation so were excluded from the study. A total of 60 women completed the study. In the present study, maximum number of patients (50, 83.34%) belonged to the age group between 25 and 32 years. The mean age was 25.73 ± 2.91 (Range: 18–32 years). None of the patients used drugs or smoked. In the present study, 35 (58.33%) patients belonged to the middle socioeconomic status group, while 14 (23.33%) patients were from low socioeconomic status and 11 (18.33%) patients were from high socioeconomic status [Table 1]. The patients were classified according to modified Kuppuswamy classification. Maximum 30 (50%) patients were educated up to secondary school, 13 (21.67%) were educated only up to primary school, and 10 (16.67%) were either graduate or postgraduates. Only seven (11.67%) were illiterate [Table 2]. In the present study, 28 (46.67%) patients had earlier two PTBs before attending our institution, while 23 (38.33%) patients had at least one previous PTB and 9 (15%) patients had 3 previous PTBs, which itself is a risk factor for recurrence of PTB in the present pregnancy. Since the study recruitment required patients with a history of at least one previous PTB, so none of the patients was primigravida. The mean cervical length in the study group was 3.33 ± 0.40 cm at the start of therapy and reduced to 2.85 ± 0.25 cm at the end of the therapy. None of our patients had cervical length <2.5 cm. Two (3.33%) patients with gestational age of 30–32 weeks and 32–34 weeks each required tocolysis, respectively. Hence, in our study, four (6.66%) patients required tocolysis. In the present study, six patients had the need of antenatal corticosteroid therapy; four (6.67%) patients had a preterm labor pains and two (3.33%) patients had intrauterine growth restriction. In the present study, maximum 50 (83.33%) patients had a normal vaginal delivery, while ten (16.67%) had required cesarean section for delivery, done for obstetric indications. Major maternal problems were gestational diabetes mellitus and intrahepatic cholestasis of pregnancy, which developed in three (5%) patients. About 11.66% had vaginal discharge or irritation and almost similar had vague pain abdomen. 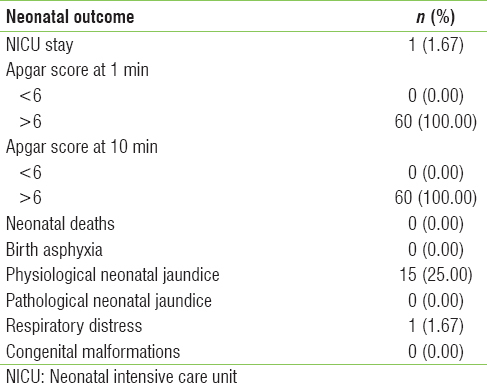 [Table 3] shows the neonatal outcome of the patients in our study. One (1.67%) neonate required NICU stay, while 15 (25%) neonates had physiological neonatal jaundice. Apart from neonates, there was no complication/problems seen in the neonates. None of the babies were delivered extremely premature and the babies who were born preterm were appropriate for date and had no complications during delivery. One (1.67%) baby had respiratory distress. There were no neonatal deaths. Complications such as birth asphyxia or intracranial hemorrhage were not observed in these newborns. None of the neonate developed any pathological jaundice, though 15% developed physiological jaundice. None of the babies were detected to have any congenital malformations at birth. In the present study, there were 60 deliveries and no neonatal death. Ten (16.7%) neonates had a birth weight between 1.5–2 Kg and 2–2.5 Kg each. A total of 30 (50%) neonates had a birth weight between 2.5 and 3 Kg and 10 (16.7%) neonates had birth weight between 3 and3.5 Kg. Thus, maximum 50 (83.3%) neonates had a normal birth weight. About 20/60 (33.33%) had birth weight <2500 g. Mean birth weight was 2.68 ± 0.41 (Range: 1.9–3.5 kg). There were 6.67% (4/60) large for gestational age, 8.33% (5/60) small for gestational age, and 85% (51/60) appropriate for gestational age. In the study, 1/60 (1.66%) delivered before 34 weeks, 14/60 (23.33%) women delivered between 34 and 36 + 6 weeks period of gestation. Overall 15/60 (25%) patients delivered before 37 weeks and 45/60 (75%) delivered after 37 weeks. Mean gestation of delivery was 37.31 ± 1.58 (Range: 33–39 weeks). How does progesterone effects to prevent PTD is not well understood, it may be due to relaxation of smooth muscle inhibiting the action of oxytocin and gap junction formation, and prostaglandin synthesis which is responsible for initiation and propagation of contraction. It is postulated that local changes at the decidua and placenta and changes in the ratio of estrogen and progesterone might be responsible for initiation of labor. Many studies have been carried out to know the effect of progesterone on PTB prevention. Meis et al. conducted a clinical-, randomized-, double-blind study on 463 patients, with a previous history of PTB. They discovered that weekly injections of 250 mg 17-OH progesterone caproate beginning at 16–20 weeks of gestation and continued to 34 weeks of gestation significantly reduced preterm delivery They also demonstrated that treatment with progesterone decreased the rate of birth weight of ≤2500 g, intraventricular hemorrhage, necrotizing enterocolitis, and need for supplemental oxygen. da Fonseca et al. used 100 mg vaginal progesterone in women with a history of PTB, showed a reduction in PTB rate which was also seen in our study. Rai et al. showed reduction in PTB with oral progesterone. Borna and Sahabi used progesterone in arrested PTL and showed improvement with prolongation of pregnancy. A Cochrane review by Dodd et al. concluded that although administration of progesterone is associated with benefits in women considered to be at increased risk of PTB due to either a prior PTB or a short cervix, there is limited information available relating to longer-term infant and childhood outcomes. Hence, they recommended the further trials in this field. Progesterones have been used for USG-documented short 28 cervix also with favorable results,,,,,,, but none of our patient had cervical length <2.5 cm. None of our patients had a birth weight of <1.5 Kg, and the mean weight was 2.68 Kg with most women delivering at a birth weight of 2.5–3 Kg. None of the babies had birth asphyxia or pathological jaundice. Vaginal progesterone was associated with cost-saving and cost-effectiveness for PTB. This study showed that administering progesterone to the pregnant women does not cause any neonatal effects, for example, pathological jaundice, respiratory distress, low Apgar, NICU admissions, etc., Similar findings were noted by other studies,, with significant reductions in NICU admissions, Intraventricular hemorrhage, and respiratory distress. Cost of NICU admissions and prolonged stay becomes an important factor for preterm babies, this cost can be significantly decreased by prolonging pregnancy. Although OPPTIMUM study by Norman et al. stated that vaginal progesterone was not associated with reduced the risk of PTB or composite neonatal adverse outcomes and had no long-term benefit or harm on outcomes in children at 2 years of age. However, a meta-analysis published in 2017 by Romero et al. supports the use of progesterone for the prevention of PTB without any deleterious effect on neonatal morbidity and neurodevelopment. O'Brien et al. studied infants exposed to progesterone in the intrauterine period till 2 years of life and found no significant effects of progesterone on these infants. Till the clouds of confusion clear the role of progesterone in the prevention of PTB, it is likely to remain an easily available and well-tolerated drug for prevention of PTB, without having any adverse neonatal effect. By prolonging pregnancy, it improves the neonatal outcome. This study shows that vaginal administration of progesterone in high-risk women for PTB starting in the second trimester and continued till 34 weeks can lower the PTB and improve the neonatal prognosis, without causing any adverse effect to the neonate. Moster D, Lie RT, Markestad T. Long-term medical and social consequences of preterm birth. N Engl J Med 2008;359:262-73. Mattison DR, Damus K, Fiore E, Petrini J, Alter C. Preterm delivery: A public health perspective. Paediatr Perinat Epidemiol 2001;15 Suppl 2:7-16. Azargoon A, Ghorbani R, Aslebahar F. Vaginal progesterone on the prevention of preterm birth and neonatal complications in high risk women: A randomized placebo-controlled double-blind study. Int J Reprod Biomed (Yazd) 2016;14:309-16. Dodd JM, Jones L, Flenady V, Cincotta R, Crowther CA. Prenatal administration of progesterone for preventing preterm birth in women considered to be at risk of preterm birth. Cochrane Database Syst Rev 2013;7:CD004947. doi: 10.1002/14651858.CD004947.pub3. Rai P, Rajaram S, Goel N, Ayalur Gopalakrishnan R, Agarwal R, Mehta S, et al. Oral micronized progesterone for prevention of preterm birth. Int J Gynaecol Obstet 2009;104:40-3. Meis PJ, Klebanoff M, Thom E, Dombrowski MP, Sibai B, Moawad AH, et al. Prevention of recurrent preterm delivery by 17 alpha-hydroxyprogesterone caproate. N Engl J Med 2003;348:2379-85. Azargoon A, Ghorbani R, Aslebahar F. Vaginal progesterone effects for the prevention of preterm birth and neonatal complications in women at increased risk: A randomized placebo-controlled double-blind study. Int J Fertil Steril 2014;8:104. Sfakianaki AK, Norwitz ER. Mechanisms of progesterone action in inhibiting prematurity. J Matern Fetal Neonatal Med 2006;19:763-72. Garfield RE, Kannan MS, Daniel EE. Gap junction formation in myometrium: Control by estrogens, progesterone, and prostaglandins. Am J Physiol 1980;238:C81-9. Mitchell B, Cruickshank B, McLean D, Challis J. Local modulation of progesterone production in human fetal membranes. J Clin Endocrinol Metab 1982;55:1237-9.
da Fonseca EB, Bittar RE, Carvalho MH, Zugaib M. Prophylactic administration of progesterone by vaginal suppository to reduce the incidence of spontaneous preterm birth in women at increased risk: A randomized placebo-controlled double-blind study. Am J Obstet Gynecol 2003;188:419-24. Borna S, Sahabi N. Progesterone for maintenance tocolytic therapy after threatened preterm labour: A randomised controlled trial. Aust N Z J Obstet Gynaecol 2008;48:58-63. O'Brien JM, Steichen JJ, Phillips JA, Creasy GW. Two year infant outcomes for children exposed to supplemental intravaginal progesterone gel in utero: secondary analysis of a multicenter, randomized, double-blind, placebo-controlled trial. Am J Obstet Gynecol 2012;206:S223. van Os MA, van der Ven AJ, Kleinrouweler CE, Schuit E, Kazemier BM, Verhoeven CJ, et al. Preventing preterm birth with progesterone in women with a short cervical length from a low-risk population: A Multicenter double-blind placebo-controlled randomized trial. Am J Perinatol 2015;32:993-1000. Majhi P, Bagga R, Kalra J, Sharma M. Intravaginal use of natural micronised progesterone to prevent pre-term birth: A randomised trial in India. J Obstet Gynaecol 2009;29:493-8. Romero R, Yeo L, Miranda J, Hassan SS, Conde-Agudelo A, Chaiworapongsa T, et al. A blueprint for the prevention of preterm birth: Vaginal progesterone in women with a short cervix. J Perinat Med 2013;41:27-44. Pizzi LT, Seligman NS, Baxter JK, Jutkowitz E, Berghella V. Cost and cost effectiveness of vaginal progesterone gel in reducing preterm birth: An economic analysis of the PREGNANT trial. Pharmacoeconomics 2014;32:467-78. Norman JE, Marlow N, Messow CM, Shennan A, Bennett PR, Thornton S, et al. Vaginal progesterone prophylaxis for preterm birth (the OPPTIMUM study): A multicentre, randomised, double-blind trial. Lancet 2016;387:2106-16. Romero R, Conde-Agudelo A, El-Refaie W, Rode L, Brizot ML, Cetingoz E, et al. Vaginal progesterone decreases preterm birth and neonatal morbidity and mortality in women with a twin gestation and a short cervix: An updated meta-analysis of individual patient data. Ultrasound Obstet Gynecol 2017;49:303-14. O'Brien JM, Steichen JJ, Philips JA, Creasy GW. Two year infant outcomes for children exposed to supplemental intravaginal progesterone gel in utero: Secondary analysis of a multicenter, randomized, double-blind, placebo-controlled trial. Am J Obstet Gynecol 2012;206:S223.